Google Voice Inbox showing SMS functions and voice mail transcription. Google sends a notification email for new voicemail with the transcription. 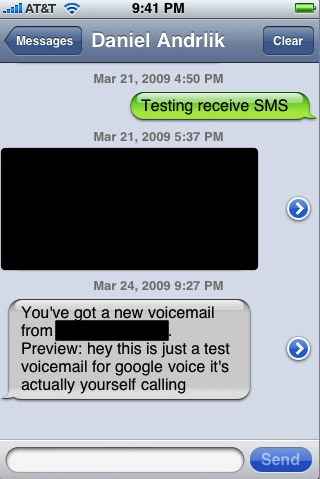 Google Voice forwards SMS messages received to my cell phone as well as voicemail notifications. These features, along with the previously existing call-routing and contact management features (which are awesome) make the service something I could easily see myself becoming dependent on in the near future. I’m already scheming to start routing more of my telephone communication (especially anyone who is not a friend or family member) through my GV account. Now, Google Voice has already received a ton of press online detailing all the new features, and rather than repeat everything that has already been said, let me just say this: I do not understand how this is not already a paid service. Slap an SLA on this service and I would not even think twice about paying $50 a year for it. The only possible reason I can think of for not doing this is to stay cheaper than Skype, which charges for having a phone number and voice mail. Skype’s international rates are still slightly cheaper than Google’s, but it’s free offerings offer nothing like the basic feature-set provided by Google Voice. I have only two one complaints about Google Voice. First, the inbox defaults to showing all messages and does not have a way for me to use the unread-only view as my default, which gets annoying because it is an extra mouse-click every time I go to look at my messages. The only way to prevent a message from showing up again is to delete it, which I don’t want to do. (Fixed: Google pushed out an update on 2009-04-02 which defaults the inbox view to unread-only, or at least it remembers my preference). Secondly, While the mobile web app is fast and great, I want a native app for managing my account on my phone. It seems like Android integration is the obvious path for Google, but I would hope they would also follow their previous practice and release an iPhone application (or integrate it into their existing app) as well. On the whole, I think this is an excellent service and a home-run for Google. It’s the first time I’ve been this excited about a Google product since Google Reader and Gmail. In fact, I’ve written this post partly in the hopes that it will help me stop telling my friends about Google Voice every time we talk to each other, as I am sure they are ready for me to shut up about it. I was even tempted to do a screencast to show off how you work with the application, but video adds a lot of difficulty to the process of hiding other people’s phone numbers, and I respect my friends’ privacy. Currently the service is only available to users with existing GrandCentral accounts, but Google has stated they plan on opening to the service to new users soon, presumably with “soon” being a value somewhere between a few weeks and just before our sun explodes. If you have used Google Voice and would like to leave me a comment about what you think, feel free to click the call widget below to leave a voicemail message with my Google Voice account. I’ll keep it active for at least a few weeks. Also, when you leave your message, please indicate if you would like your message included in this post. I don’t promise that I will include your message, but I do promise that if you leave me a voicemail I will not post the audio or your name without your permission. I reserve the write to quote you anonymously in text, however, because I like to write and that’s just the way I roll.